Thank you and congratulations to our 2018 puppy parents, all sold before whelping. Fall Puppies: Get a pumpkin and a puppy. Reservations suggested. 3. My brother has a beautiful litter of white/tan field bred English Cocker Spaniels, the best for field and home. Call 856-305-5179. 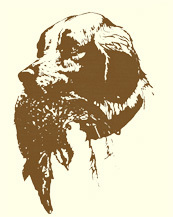 Quail Hollow is the purveyor of the classic American Brittany, personal shooting dogs line bred for over forty years. In breeding, conformation, and performance Quail Hollow Brittanys will compare favorably to the best in America and Canada. We promote the Dual Concept - top Gun Dogs but Britts that also conform to the standards of the breed. Our Brittanys also make wonderful pets. Quality does pay. A Brittany is a 12 to 15 year investment. That is a long time to regret an inferior purchase. Quail Hollow dogs have established an excellent reputation country and worldwide and as a result, many are spoken for long before birth. Our Brittany puppies, male or female, are $1200.00 to eight weeks of age. The puppies are guaranteed healthy. They will have their first DHLP, Parvo, Corona and worming; you will receive a Veterinary certificate of health. The puppies are in excellent condition with a bold, out-going disposition - one with potential plus. A $100.00 deposit will hold the pup of your choice until he/she is ready to leave the kennel. Our started and trained Brittanys are also from Quail Hollow and other nationally recognized Champion bloodlines. Their price ranges from $1,400.00 to $6,500.00, depending upon age, experience and performance. You may personally visit the kennel to pick up your new pup. However, if this is not feasible, upon receipt of full payment for your Brittany plus a $125.00 transportation fee, your choice will be shipped to you collect to your nearest airport. Federal regulations require that a certain type shipping crate will be used. They are well built and large enough to accommodate a full grown Britt to and from the field. They are also an invaluable aid for housebreaking the new pup. The cost of the shipping crate is $60.00 to $120.00, depending upon size. Payment is made along with the shipping charges when you pick up your pup.